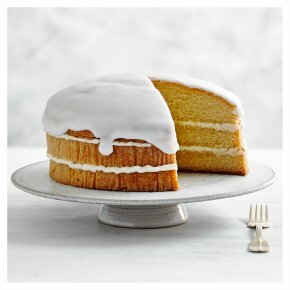 A zesty and buttery 3 layer lemon sponge cake, filled with lemon buttercream and lemon curd, drizzled with lemon icing and topped with tangy lemon sugar crystals. This product is supplied ready to serve. INGREDIENTS: sugar, fortified wheat flour (wheat flour, calcium carbonate, iron, niacin, thiamin), rapeseed oil, butter (milk), dried free range egg, lemon zest, water, free range whole egg, raising agents (diphosphates, potassium bicarbonate, sodium bicarbonate), salted butter (milk), lemon juice, emulsifiers (mono- and diglycerides of fatty acids, sodium stearoyl-2-lactylate), maize and wheat glucose-fructose, milk whey powder, apricots, lemon oil, preservatives (potassium sorbate, sulphur dioxide), salt, citric acid, gelling agents (pectin), acidity regulators (sodium citrates, malic acid), flavouring, colour (riboflavin). For allergens, including cereals containing gluten, see ingredients in bold. May contain: peanuts,nuts.